Note that the word "lǎo bǎn" in Chinese roughly means "old boss." He was saying that he could get rich by working as a trishaw driver. He said you had to know management and had common sense. He probably meant well. The following was adapted from what I have written for Bachelor of Arts in Religious Studies 15th Anniversary Magazine. When I first came to teach at BARS, I was just out of college and a young man full of energy thinking to change the world. 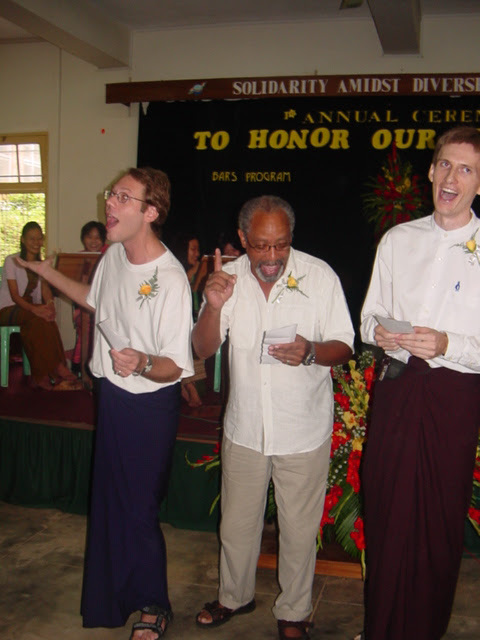 I arrived in Myanmar on Dec 11, 2002. On that same day in the afternoon, I went to see the famous Dean of BARS, Saya Paw Lu. I still remember the first day I went to the office of Saya Paw Lu. I was wearing a pair of short pants made out of Karen longyi sheet because it was so hot outside. I just switched from 0 degrees Fahrenheit in Indiana to 90 degrees in Yangon in a day. I went into the office and introduced myself to Saya Paw Lu. I will never forget the look on Saya's face seeing me in shorts. I guess I didn't look like a teacher, wearing shorts.